Spring has sprung. The flowers are blooming, butterflies are fluttering and the Easter bunny is on his way. Easter was always one of my favorite holidays as a kid. We would wake up Easter Sunday with a basket full of goodies at our bedside. After unloading the basket to see all of the fun stuff the Easter Bunny brought us, we would head out of our rooms to hunt for the eggs that got hidden all over our house. Now, as the mom, it’s my job to make the magic of the Easter Bunny come to life for my family. I’m on the hunt to find just the right goodies to fill my families baskets this year. If you’re also on the hunt, check out some of our favorite Easter and fun Spring items here. We received a variety of samples in exchange for this post. Affiliate links are used in this post. All opinions are our own. Add fun to their Easter baskets with one of these fun games from Pressman Toys! 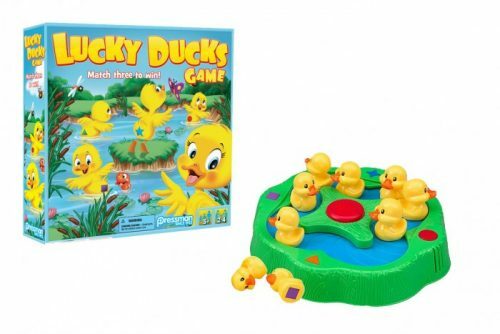 My favorite pick perfect for toddler and preschoolers baskets is Lucky Ducks game. They’ll seek for a match while the darling little ducks swim around the pond. The sweet little ducks are perfect for Spring. Or, try your best to keep all the balls inside Mr. Bucket as he quickly spits them out again and moves away! Another perfect pick for spring is Let’s Go Fishin’! Pretend like you’re fishing from the comfort of your own home with this cute game. The little fish will pop up and open their mouths and you’ll need to try to “catch” the fish with the included fishing poles! Older kids will be thrilled to find Harry Potter Magical Beasts interactive game in their basket this year. 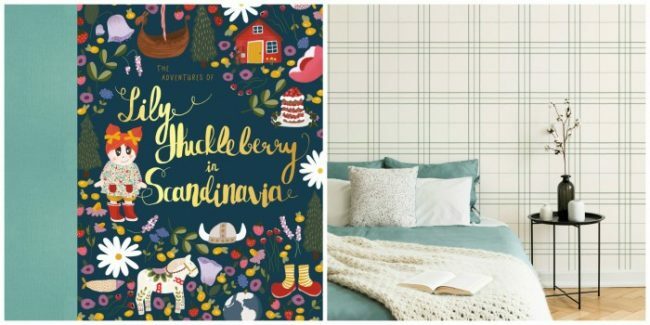 If you’re looking for a beautifully illustrated about adventure book to add your child’s Easter basket, then look no further than The Adventures of Lily Huckleberry in Scandinavia. This book is the first in a series by Audrey Smit and Jacki Knapp showcasing a brave female character that explores the world. Follow along with Lily as she discovers the beauty and wonder of Scandinavia. Click on the link to watch the video trailer of The Adventures of Lily Huckleberry in Scandinavia. In honor of The Adventures of Lily Huckleberry in Scandinavia, you can also explore the most adorable Lily Huckleberry Collection by This Little Street. Browse adorable luggage tags, prints, and coloring books! This Little Street also offers a variety of removable wallpapers that I’m drooling over! So many fun spring finds! Getting a kite in my Easter Basket was one of my favorite childhood memories. This year, my kids’ Easter Baskets are going to be vibrant and colorful with Antsy Pants adorable kites. Available in a variety of different patterns, there is a kite perfect for every Easter Basket. 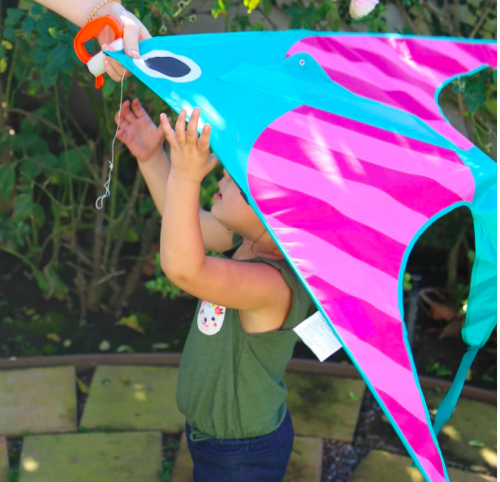 You’ll absolutely fall in love with the Flamingo, Fish, and Shark shapes. These single line kites make flying a breeze. Plus, they’re only $11.99 at Target. For other fun Antsy Pants Easter Basket fillers, check out their variety of play kits, gymnastics toys, and jump ropes. I love finding Easter basket fillers that will help my children learn through play. That’s why I’m SO excited to add these Animal Jumble Magformers . This 60 piece set allows children to build and create different kinds of animals using Magformers geometric magnetic blocks. 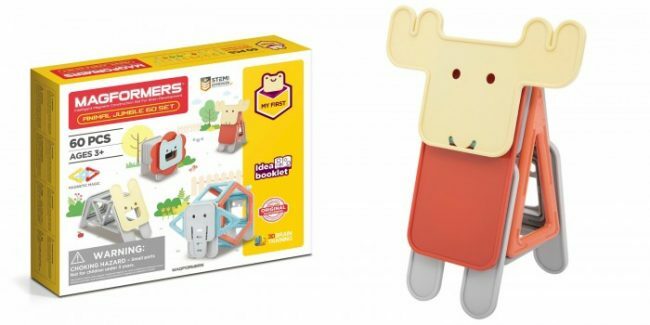 Your kids will love building different animals like elephants, tigers, and bunnies. Something that my kids love about Magformers is that the magnets never repel – they always click; providing a sturdy hold while they create. Magformers make the perfect quiet time activity helping encourage creativity and fine motor skills. Books in Easter baskets is a no brainer! This year, take your books up a notch with these fun and creative activity books from Quarto. 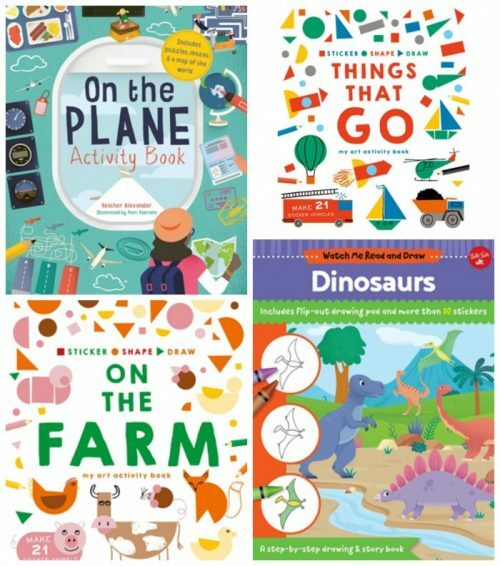 Quarto offers a variety of different activity books perfect for kids of all ages. Whether your child likes to learn how to draw, complete mazes, or create things with shapes, there is an activity book for every kid. Take a fresh approach to your cleaning tools this spring with the modern designs and innovative products by Full Circle. All of their home care and cleaning products are thoughtfully designed to fit your home and style while being great for families and manufactured with sustainable business practices. The Tiny Team, a set that includes a mini brush and dustpan, is awesome for cleaning up small crumbs and messes on the counter! No more wiping up all those crumbs into your hand to dump – this set takes care of those messes with ease! Another smart product is the Bubble Up set with a handheld dish brush and a ceramic holder that is stylish — and functional! Simply press down on the base to create extra suds and dispense soap to help with dish duty! 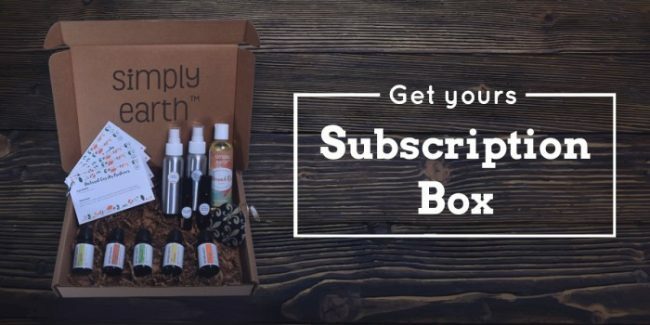 Make your own natural home products with the fun new subscription service by Simply Earth. In their Essential Oil Recipe Box you’ll find a set of essential oils and other essentials plus 6 natural recipes to create the perfect natural products for your home and life. April’s box, for example, includes a homemade surface cleaner, dishwashing detergent, foaming hand wash, natural laundry detergent and more! The Essential Oil Recipe Box includes over a $150 value for as low as $39/month and free shipping! What’s even better is you can even get a bonus box (ARV $40) on your new subscription. PLUS, for a limited time, earn a $20 gift card good towards a future purchase or your next box with the promo code: AMOMSTAKEFREE. So what are you waiting for? You can grab your Simply Earth Essential Oil Recipe Box today and it will ship the next business day with fast 2-3 day shipping! Your little future scientist or engineer will love discovering how things work with the Hape Discovery Scientific Workbench. It will guide them to discover and explore with 10 different experiments and STEAM projects they can create. Learn about concepts such as momentum and gravity while mixing and matching the pieces to build the included experiments and then they can come up with their own! The Discovery Scientific Workbench is designed for age 4 and up. All four of my boys, ages 4-12, have spent hours playing with this workbench. I love watching them totally engaged with learning how things work and trying to craft their own configurations! 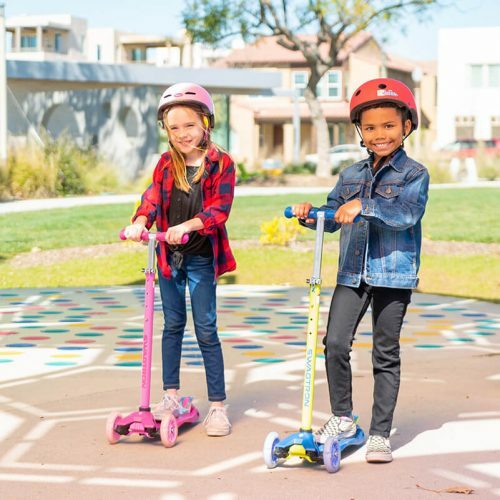 Get the kids to love spending time outdoors this spring with Swagtron scooters! The K5 three-wheeled scooter is perfect as a first scooter for first-time riders! The two front wheels help keep the scooter balanced and upright. The light up wheels adds so much fun and helps keep them safer in low light. Adjust the handlebar height to fit their needs and let the scooter grow with your child. Older kids and adults can join in on the scooter fun with the larger K8 Titan kick scooter. It’s a lightweight and foldable scooter that can go with you anywhere — yet big enough for even adults to ride! The K8 scooter can accommodate up to 220 lbs and has extra-large wheels for a smooth and comfortable ride. One of our favorite springtime activities is drawing! Perfect for rainy days, my kids love to spend hours coloring, drawing, and painting. This spring, kick art time up a notch with the Smart Sketcher Drawing Projector. 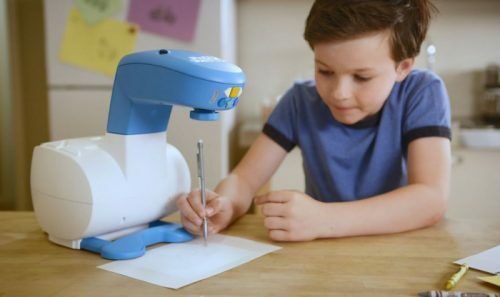 Aimed for ages 5-105, the Smart Sketcher Drawing Projector has SO many cool features. Use the Smart Sketcher for step by step drawing instructions, learn how to write letters and numbers, turn any photo into a traceable imagine (using the app), and download pictures and draw them. Use crayons, markers, colored pencils, etc to create the perfect work of art. Make your house the “Fun” house to hang out at by collecting an assortment of games and activities from Front Porch Classics. Springtime is the best time for fun, games and getting the kids together around a competitive game of Tabletop Shuffleboard. 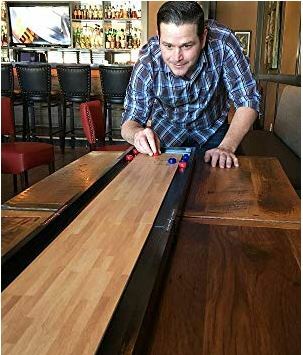 The Tabletop Shuffleboard from Front Porch Classics is extremely easy to set up and take down. Within minutes, you will have the game set up and ready to play. At roughly 5 feet long fully assembled, the sturdy wood game will create hours of party fun. Be the first person to make 15 points by sliding your pucks furthest down the alley, without falling off the end or into the sides. Get back at your opponent by hitting their puck off and stealing the win! With warmer weather in the air, it’s time to start looking for the perfect swimsuit. Thankfully, Yaffi offers affordable and stylish matching swimwear perfect for the entire family. Let’s be honest, is there anything cuter than a mom/daughter matching at the pool? Plus, you can find them on Amazon – 2-day shipping is always a plus! 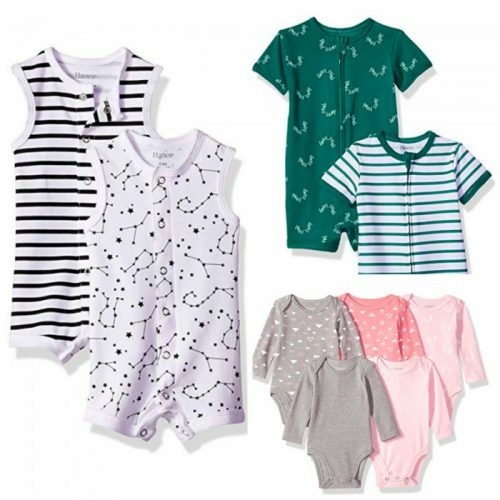 Did you know that Hanes has a new babywear line available on Amazon? That’s right, talk about comfortable, fashionable, and affordable spring basics perfect for your little one. With Hanes Zippin and Flexin Collection, your little one can wear their clothes longer because these basics are designed to stretch and flex. Plus, just look at some of the cute patterns! 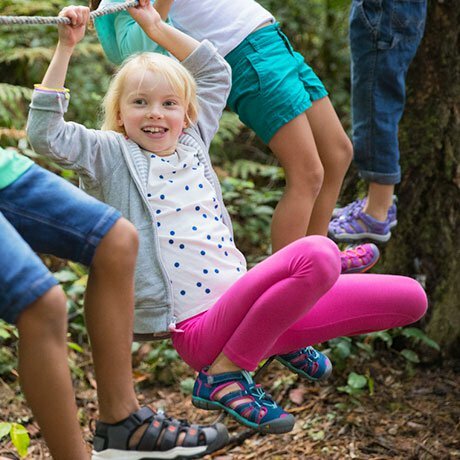 Help your whole family take advantage of the beautiful Spring weather and warmer days ahead with KEEN footwear. Whether your family prefers hiking, camping, going to the lake or pools, or heading out on other adventures, these kids sandals will be up for anything! They provide protection to their toes and soles while keeping their feet breezy and water-ready with the strap design and secure fit. They are quick and easy to get on and best of all — they’re machine washable! Our family adores KEEN footwear’s line of shoes! We’ve found that they actually hold up against our destructive boys and are great for every adventure our family embarks on. These fun spring sandal picks provide actual protection, especially for their soles and toes, but help keep their feet cool all summer long. Newport H2 – Supportive with a quick-drying webbing. Moxie – Sandal for girls that love adventure. Seacamp II CNX – A hybrid sandal for water and land. Newport Neo – A sole designed for all terrains while being lightweight. Spring is the perfect time to update everyone’s wardrobe, including the baby’s. This spring, swaddle in style with SwaddleDesigns. Available in a variety of sizes, patterns, styles, and material, there are swaddles to meet all of your spring needs. I feel that my babies are always SO much calmer and sleep better when swaddled. I’ve tried a variety of swaddles, and SwaddleDesigns are top notch. Perfect for newborns, the Swaddle Sack with Wrap comes equipped with uniquely shaped sleeves allowing parents to swaddle their newborns a variety of ways – arms up, hands up, and hands on chest. As your baby continues to grow, you’ll love using the Transitional Swaddle Sack, perfect for 3-6 months. If your baby is rolling over, but not ready for a loose fitting sleep sack, you’ll love Swaddle Design’s Transitional Swaddle Sack. The snug fit guarantees safety and a good night sleep. For ages 6-18 months, the zzZipMe Sack is a wearable blanket that keeps baby warm and safe. Getting a new Easter Dress is one of my very favorite traditions. This Easter, I’ve got my eyes on adorable dresses from Lanoosh. From chic wear to active clothes, Lanoosh provides stylish picks for Mom and kids. Best of all, there’s an adorable line of Mommy & Me activewear and dresses! Perfect for spring weather, you’ve got to check out Lanoosh‘s variety of leggings, shorts, skirts, tops, and accessories. Something that I appreciate about Lanoosh is how unique each article of clothing is – their designs are one-of-a-kind. For lightweight, stylish dresses, I can’t get enough of the CiCi Dream Dress (pictured above) and Dove Sev Dress. Talk about the perfect spring classics! 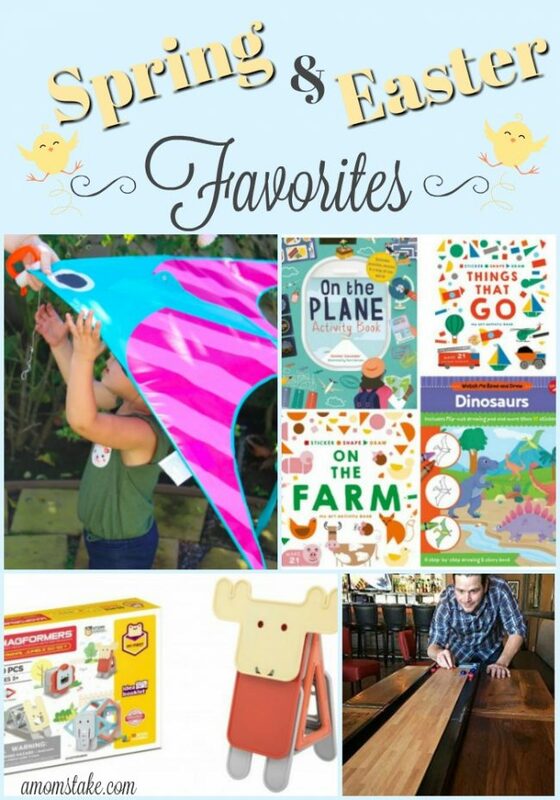 Which of these Spring and Easter favorites would your family love?